The Bentley Continental GT is powered by a 6 litre 12 cylinder W formation six litre engine utilising twin turbo-chargers to produce a massive 552bhp which drives all four wheels giving a top speed of 198mph. The Bentley Continental GT can reach 60mph from a standing start in 4.8 seconds. Additional information about the Bentley Continental GT Graphic: Powered by a 6 litre 12 cylinder W formation six litre engine utilising twin turbo-chargers to produce a massive 552bhp driving all four wheels. 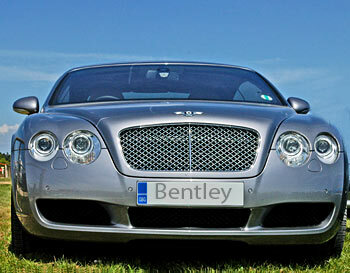 Siteseen Ltd. are the sole copyright holders of this Bentley Continental GT picture, unless otherwise stated. We only authorise non-commercial picture use and particularly encourage their use for educational purposes. This Bentley Continental GT Fast Car picture is not in the Public Domain. 1) www.educationalresource.info must be credited as the copyright holders wherever this Bentley Continental GT fast car picture is used. 3) Use of this Bentley Continental GT fast car picture, or any of our pictures on websites re-distributing copyright free material is strictly prohibited.